Pirates versus Dinos? How About Pirates with Dinos? Pirates versus Dinosaurs was what grabbed the headlines. It had been the central feature which got people excited prior to the release of Ixalan, and the block certainly delivered on that front. Especially after the release of Rivals, however, players found that one of the most promising strategies was to have the two tribes work together. No better way to get the big bulky Dinos onto the battlefield in time than to invest some of the Pirates' hard-earned Treasure. One of the most passionate proponents of pairing Pirates and Pterodons was Thoralf Severin. Always on the cutting edge of Limited trends and technology, the German player had often had successful runs at GPs, including two previous trips to the semifinals. 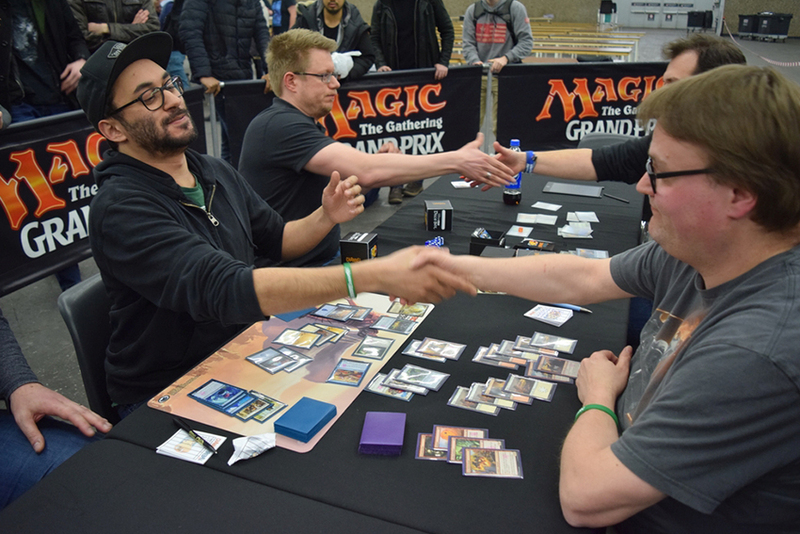 At this event, he was as happy as can be, because Team Sealed even provided additional incentive to build a Pirate/Treasure deck splashing for the splashiest of Dinosaurs. Being the expert, his teammates wisely left that archetype to him, taking up Vampires and Merfolk themselves. 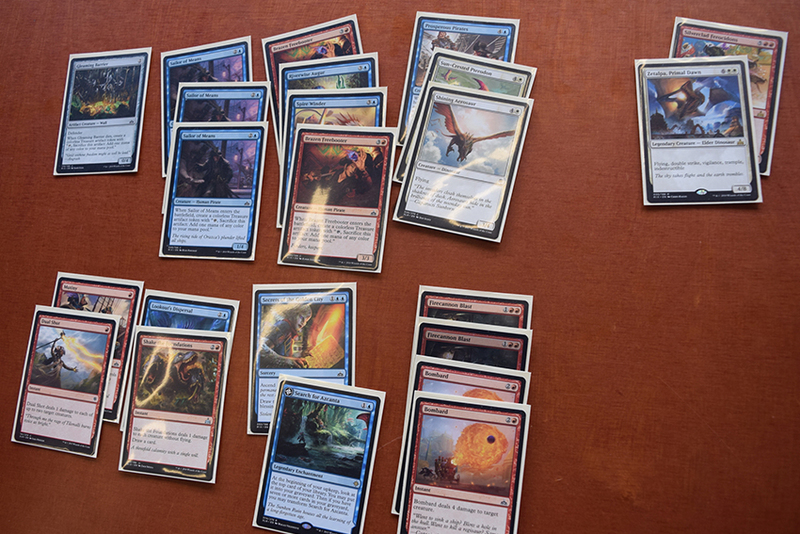 So Severin got to run a deck based in red and blue on both Saturday and Sunday, each with some Dinosaurs at the top of the curve. The sweetest of the two featured a Zetalpa, Primal Dawn which he could cast as early as turn five, at least if opponents were foolish enough to kill his Gleaming Barrier. "But much more relevant is that it only takes a single Prosperous Pirates to get Zetalpa out by turn six," Severin pointed out. He also mentioned that the deck's Treasure was by no means working to full capacity yet. "If our pool had included, say, Zacama, Primal Calamity, I would have jumped at the chance to put it into this deck as well." The short answer was no. The longer answer, meanwhile, would have to acknowledge that quite a number of high-profile teams dropped out of contention and out of the tournament early on Saturday: the team-up of the two French Hall of Famers Gabriel Nassif and Raphaël Lévy with Amiel Tenenbaum, for instance, or the two Worlds finalists (5) Javier Dominguez and (17) Márcio Carvalho who played together with recent WMC semifinalist Marc Tobiasch. No better fared Canada's (25) Alexander Hayne, neither did Zac Hill and Gaudenis Vidugiris who had come all the way from the States, nor (23) Liu Yuchen from China. Some blamed bad luck or the format or Tetzimoc, Primal Death. Because, of course they would; it's a time-honored tradition among Magic players. A notable exception proved Petr Sochůrek who had teamed up with (12) Martin Jůza and (24) Grzegorz Kowalski. He told me that they really hadn't been unlucky but quite simply played badly. I voiced disbelief at that, but Sochůrek insisted. "For example, in our last round, we decided to board into a different deck, but we didn't have it ready. 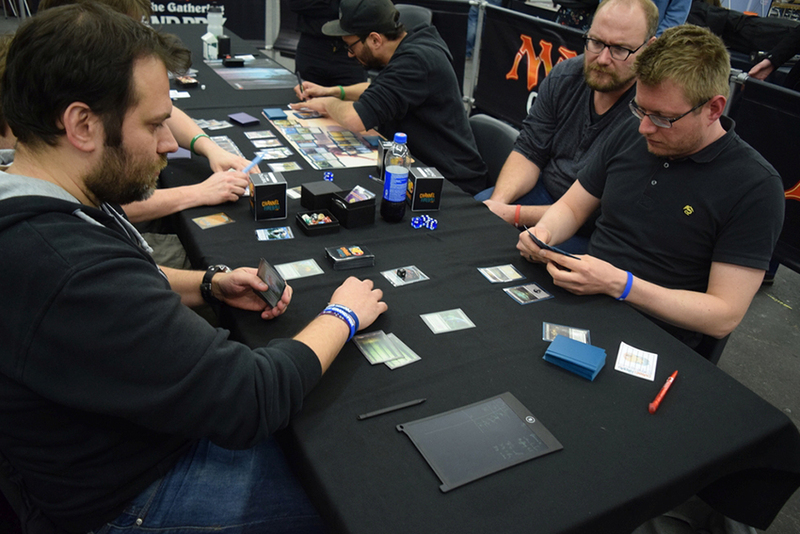 So in our hurry, we forgot about a dual land, and then I lost because of color screw," said the two-time GP champion, proving that even great players don't always play great Magic. 21 out of 44 amounts to 48%. Meanwhile, the baseline for Day 2 conversion—72 teams out of an original 522—came to barely 14%. So, compared to all the others, more than four times as many of the 44 most notable teams made the cut. Pros in peril? Hardly. Intentional Draws? What Intentional Draws? 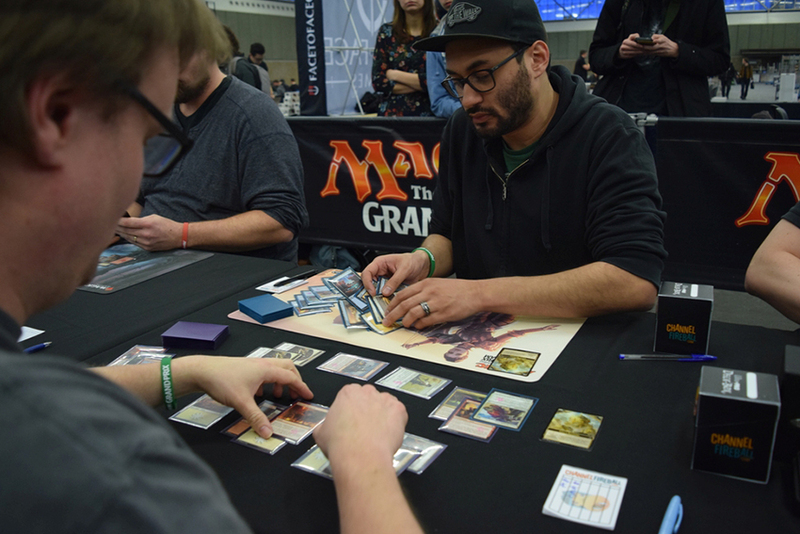 The final round of a Grand Prix often sees the top-ranked players agree to a draw which results in everyone involved advancing to the playoffs. At Grand Prix Amsterdam, this wasn't possible. All the teams at the top four tables had to play. Only if Kreijne-Geurts-Heijne won at table one and Dewulf-Meulders-Bastogne won at table four, then one of the remaining tables could draw safely. Well, Dewulf-Meulders-Bastogne won their match, but the match at table one finished with one team going to 36 points and the other staying at 34. So no draws were possible, right? "... right," Thoralf Severin admitted sheepishly. His team and their opponents did in fact agree to a draw at the end of Round 14. As Severin explained, "None of us realized that one of the teams at table one already had a draw. We thought that both were at 33 points before the round, and that a draw would leave all of us with more points than at least one of the teams." The German team made it into the Top 4 anyway, but their opponents were left out and finished the tournament in fifth place. Game Day Champions? How About Grand Prix Champions? The finals was the classic story of David versus Goliath. 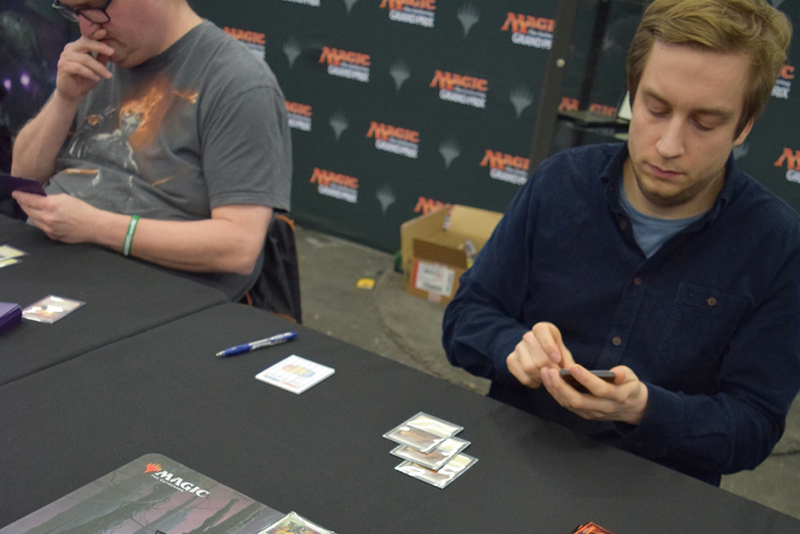 On one side sat the team of Geoffrey Siron, Vincent Lemoine, and Davy Loeb with four previous Grand Prix Top 8s and three Pro Tour Top 8s, including one win, between them. 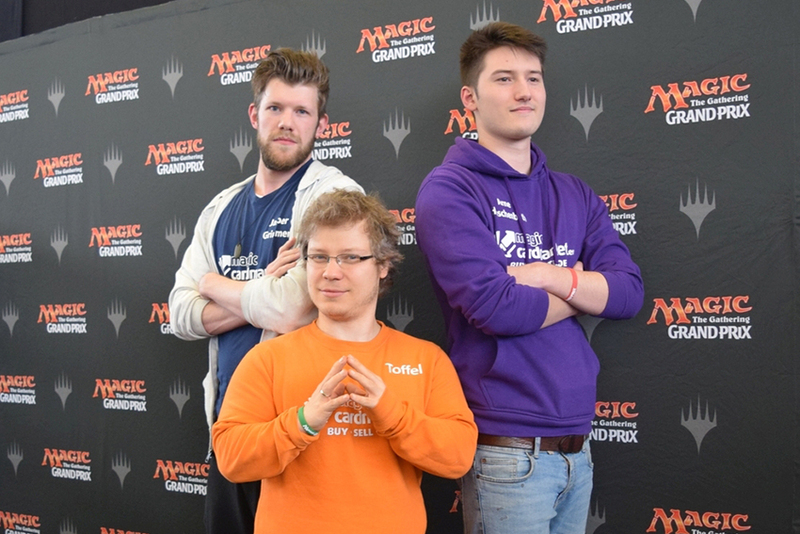 On the other side we had Jeroen Kreijne, Simon Geurts, and Pim Heijne, all three of whom had listed Game Day champion as their chief accomplishment so far. "How did we get here?" Geurts wondered. The match was a rollercoaster ride of ups and downs. First to finish was the battle between Siron and Kreijne. 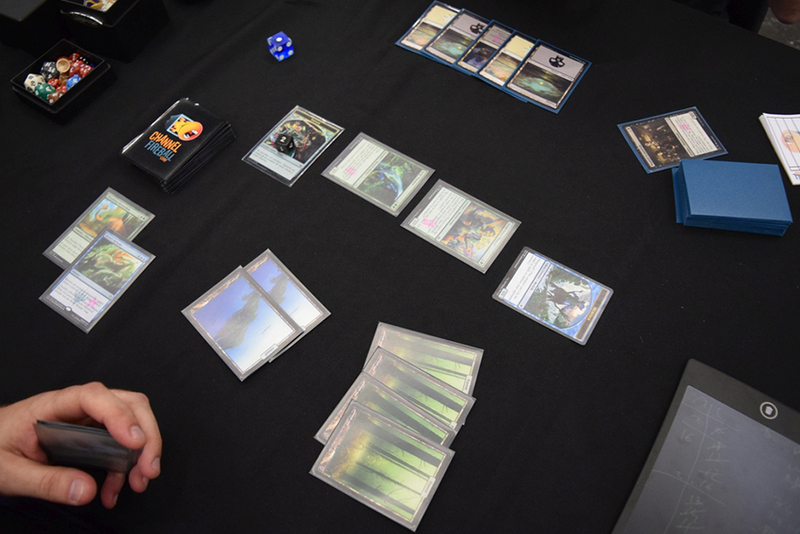 In game one, Siron didn't have a fourth land, and no source of black mana, while Kreijne curved out with cheap creatures and Pirate's Cutlass. The second game had Kreijne stuck on two lands for a while. However, Siron could barely capitalize on that, as he had drawn eight lands by turn six. When Kreijne finally found lands, Siron stood no chance. 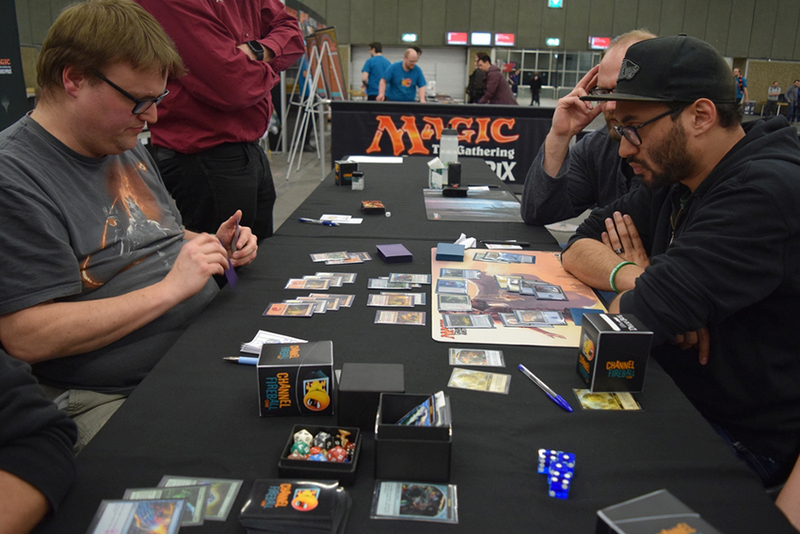 The fight between Davy Loeb's Merfolk and Pim Heijne's Vampires, meanwhile, went to three games. The first game went to Heijne after he got a two-for-one trade with an early Golden Demise and a three-for-one with Vona's Hunger, when his Sanguine Glorifier-boosted Queen's Agent was triple-blocked. Loeb returned the favor and won the second game in equally brutal fashion. His River's Rebuke cleared away all blockers, allowed Loeb to bring Heijne to 5, and his Crashing Tide on the following turn clinched the game. Loeb began their final duel with Mist-Cloaked Herald and Giltgrove Stalker, and then ambushed Heijne's Dinosaur Hunter with Swift Warden—successfully, as Swift Warden was immune to Moment of Craving by the time it was declared as a blocker. Jade Bearer and Hunt the Weak followed. Soon Heijne was forced to go for one last-ditch effort with Squire's Devotion, but Loeb had Negate to stop that, and Watertrap Weaver to add insult to injury. 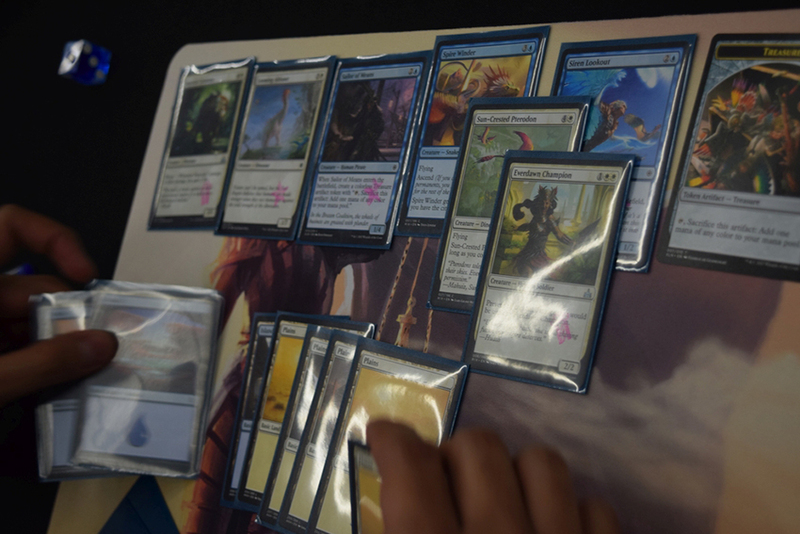 Lemoine had drafted a red-white aggro deck, while Geurts tried to take control with his white-blue. Interestingly, each had the tools to beat the other's strategy. For instance, Relentless Raptor was kept at bay by Gleaming Barrier until Lemoine enchanted it with Tilonalli's Crown. But then the Raptor was bounced by Crashing Tide, just to return to the battlefield and pick up Swashbuckling. Only Geurts's Pious Interdiction put a stop to the Raptor's relentless assault. However, a few turns later, Lemoine was able to get his army of small creatures to match up favoribly with Geurts's blockers after all, thanks to Pride of Conquerors. Then, just as Geurts was about to take control with Nehazal, Primal Tide, Lemoine drew Dinosaur Stampede. 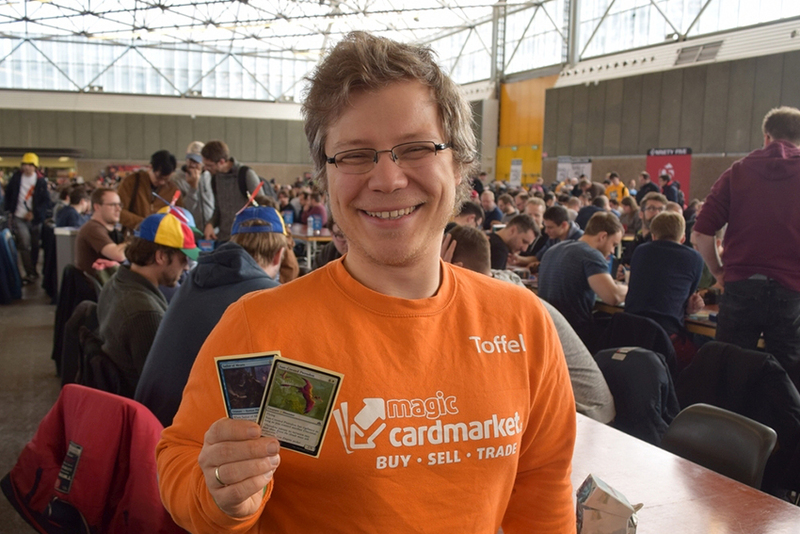 "That's a good topdeck," Geurts said appreciatively. He counted the damage, nodded in resignation, and picked up his cards. 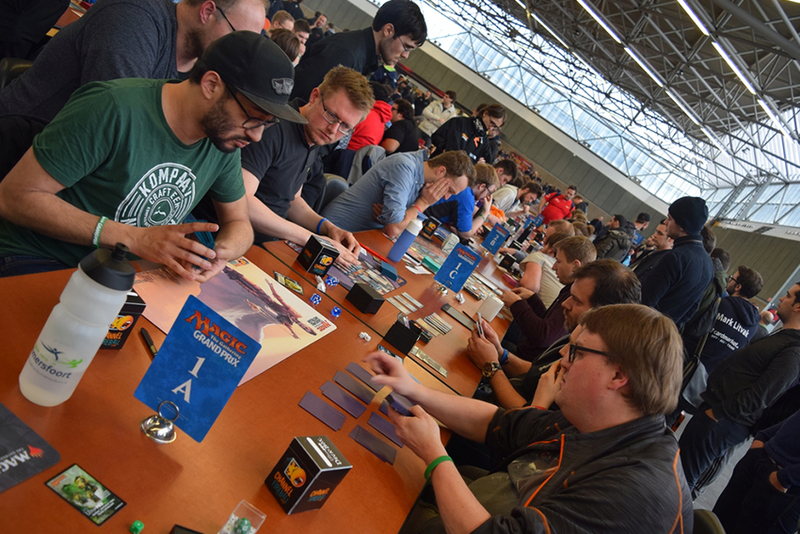 It did take a while, but eventually Lemoine admitted defeat, reached across the table, and became the first to congratulate Geurts and company, the newly-minted champions of Grand Prix Amsterdam 2018!